CMS vs LMS: What’s The Difference? 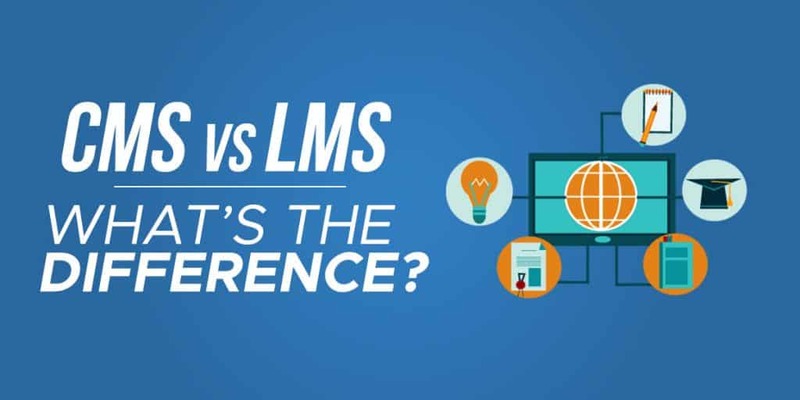 CMS vs LMS, what difference does one letter in an acronym make? What's the difference between a CMS and an LMS? Both are online platforms that you can use to create and offer online courses. An LMS is more structured and user-friendly for instructors. A CMS has more of a general purpose for storing, organizing, and presenting data with less of a focus on learning. It can be great for more open-ended and self-learning courses where assessment or tracking of student progress isn't required. In this article we'll look at some key differences between an LMS and a CMS, what features each offers, and try to help you determine which is best for your needs. LMS stands for a learning management system. It's a web-based technology or software application that you can use as a course creator to plan out, release, and assess your learning process. LMS platforms were initially created for controlled and consistent training in a corporate work environment. Companies originally used them to make their company-wide training programs like health and safety or employee harassment awareness more organized and consistent. You can see some examples of well know LMS's like Moodle and Edmundo here. Learning management systems are still most commonly used for training in higher education environments and in the workplace. They're a way for companies to store and organize their material securely, assign learning programs to employees and track their progress, create tasks and documents, engage with students, and evaluate results. LMS are highly flexible when it comes to designing, creating, organizing, and selling the content of your course. CMS stands for a content management system. It can either be one software application or a series of related programs that instructors can use to manage and create their digital course content. It's a digital place where content can be displayed and collaborated on by multiple team members. You can see some examples of well known CMS's like WordPress and Drupal here. Whereas for an LMS the focus is on tracking the progress of end users and delivering content, a content management system is mostly based around the content creation process. Most CMS platforms will let you set access controls, collaborate on content with other users, and upload and organize content. Content can be published or unpublished on demand. They also allow you to index and search stored information. WordPress is one of the most well known examples of a content management system. Instead of needing to call a web programmer whenever you want to update your website, someone with access can just log in and make the desired changes without any knowledge of HTML or CSS. There's still a learning curve and working with a CMS may be difficult for someone who isn't very technology literate. But it's certainly a big step up from having to code your website yourself. Allows you to create and upload content. This includes things like text, images, and video. Create different layers of access. You can restrict and change how information is presented based on the user. While a CMS can be used for learning and education, it has many other uses as well. So overall, the biggest difference between a CMS and an LMS is who the key user is. A CMS is essentially just a storage and organization system that doesn't really prioritize either the course instructor or the student. An LMS is much more learner-focused. The learning management system you choose to implement can have a big impact on how people will use the content you're delivering through your course. An LMS is a true platform with a lot more capabilities, whereas a CMS can be part of a learning tool but it's more of a blank canvas that you'll need to build upon. Which tool you'll need really depends on what you need from a tool and what your top priorities are. Both systems can be used to create a great online portal or website for students to engage with content, interact with other learners, and sign up for classes. So it can be a bit confusing when their acronyms are only one letter off. LMS and CMS are types of applications you can use to organize content on a website. Both can be accessed and edited by multiple users, and both can be fundamental to a student's e-learning experience. If you're looking to create a very structured online course that will be worked through in a specific order, with assessments along the way and tracking of progress, then an LMS is likely a better option for you. An LMS allows for more content automation, scheduled events, and can be easier when it comes to updating content. An LMS is definitely a lot more robust and offers more options. If you think it's an LMS you need then check out my article on the best WordPress LMS plugins to find out more. If your course will be more like a large collection of information and lessons that students can work through at their own pace and the focus is more on self-learning without necessarily holding your students accountable, then a CMS might be better for you. A CMS is much more of a passive application where your students can just view documents at their own leisure. A CMS and LMS might look the same from a student's perspective. But as a teacher, the back-end of an LMS is generally a lot more user-friendly, well structured and easy to use. An LMS tends to be a bit more expensive, but for the improved speed and efficiency of use, it might be worth paying extra so you don't have to deal with the extra work of a CMS. What Tool Do You Need? What tool you need really depends on what outcomes you're looking for. I know that seems like a vague answer, but the truth is that you can likely create slightly different versions of what you're looking for in either solution. An LMS is great specifically for teaching or training. They're used mostly by educational organizations and businesses to deliver lessons and educational materials online. Creating a course with an LMS is as easy as uploading content and stacking pieces of content together to create a curriculum. An LMS gives students a more active role in their learning. They work through the content and are often given quizzes or other forms of assessments at regular intervals during the training. A CMS is great for building content in general. A CMS gives you total control over who can edit a piece of content, and whether it's available to the public or only specific users. It's an easy way to edit and store different kinds of website content. A user's experience with a CMS is more passive. It's kind of like browsing a website. You make content available, but there isn't much interaction for the user except looking at it. From everything I've said so far, it might sound like an LMS is the clear winner when it comes to creating online courses. But there are plenty of applications where a CMS might be a better choice. For example, membership sites. You might want to give your users access to a wide range of educational material, but not necessarily require them to work through the material in any specific order. A CMS might be viewed as more akin to giving users access to a “digital filing cabinet” for them to sort through as they see most helpful, as opposed to presenting them with a textbook they need to read from beginning to end. Flexible Pricing. Many of the LMS platforms on the market today are developed by modern startups and smaller companies, so they understand the need to make systems that can vary based on the size and needs of different companies. You might not need all the capabilities and features that a much larger website is looking for when you're just starting off. The most common ways for LMS companies to price their services are either as a tiered payment plan based on the size of your business, or on a pay-per-user model. Many also offer a discount if you pay for an annual plan all up front instead of paying month by month. Customization. In the past, LMS platforms often all looked pretty similar. Technology sometimes leads the learning, as opposed to the way it should be, with learning leading the technology. But today's LMS providers understand that customization is a critical part of your online learning offerings. Today both instructors and students have tons of options when it comes to creating different profiles, sharing content with each other, adjusting content, and how they engage with the material overall. Scalability. Older systems really limited how fast a company could grow with one LMS platform. Because most modern LMS platforms are cloud-based, it's easy for them to change to support any number of students. Your costs and learning approaches automatically and immediately adjust to meet your needs whether your number of students goes up or down. Collaboration. Today's LMS systems give lots of different ways to collaborate, both members collaborating with other members, and also between instructors and students. There are more communication channels available than ever before, and updates usually happen in real time. Convenience. Courses no longer need to be completed in the workplace or on campus. Learners can take courses from home in their own time when it's convenient for them. You also aren't limited by the size or number of classrooms or meeting rooms you have. It's often not much more work to have 1 or 100 learners work through an LMS module at a time unless you're manually grading assignments they're submitting. Easily track progress. An LMS makes it easy to track your student's progress. You don't have to worry about whether work is getting done because you can't hold them accountable in person. Your LMS back-end will let you see who has started and finished the course, what module individual people are on, how long each module took them to complete, their quiz results and how many quiz attempts they took. Not only is this great for tracking your students, but also for evaluating how effective your course is. If there are areas where people seem to be getting stuck or find the information vague, you can spot it and make improvements to your course content right away. They restrict information. In most LMS platforms, only current students are able to see courses, access course forums, and other information. Once the course is over or completed, students are often not able to go back and refresh their knowledge without asking an administrator to reset the platform for them. They can be expensive. Normally you need to pay a license fee each year for a proprietary learning management system. If you use an open LMS, you'll need to have the equipment needed to host it yourself or pay for additional hosting. And you might need to pay for some extra IT support employees to maintain the system and provide technical support to both instructors and students. Vendor lock-in. Once you get established with one learning management system, it can be very difficult to switch over to another one. Course modules might not function the same on a different system and may need to be entirely reworked. In a corporate or educational setting, you might also get complaints and pushback from both students and teachers if you try to switch to a new platform. Advertisements. Sometimes learning management systems will display advertisements in their course material. In my opinion this is unacceptable when you're likely paying a large annual fee to use their services, and I'd avoid any LMS platform that inserts ads into the learning experience. You don't have full control. If your courses are hosted on an external LMS, that raises questions about the security of personal information and data, as well as potential interruptions to service. A security breach could affect your organization's reputation. You might have little to no recourse if the third party LMS applications you use aren't well maintained, are taken offline for maintenance at inconvenient times, or even just suddenly disappear. Makes building a website easier. CMS platforms offer either pre-made or custom-made templates that you can use to create your site. The alternative would be to try and code the entire thing yourself from scratch, or hire someone else to do it. You don't need to know HTML, CSS, PHP, or any other markup or styles sheet languages to make your site, so it's more user-friendly for beginners. Lots of options to choose from. There are plenty of free CMS options to choose from. WordPress is by far the most popular, but Drupal and Joomla are also widely used. Potentially faster development. A CMS might make it quicker to design and develop your website, and fix any potential problems that arise during the creation process. Lower cost overall. A CMS is more in the price range of what a new independent course creator can afford. You won't have to pay so much for web administration and web development costs. A CMS streamlines the creation process using simple and easy to use interfaces. That makes it possible to do everything yourself if you want. Many features are already developed. There are an estimated 30,000 or more WordPress plugins and widgets for you to choose from. So pretty much any customization you want to do to your website can be easily implemented with just a few clicks. No need to hire a developer to create a custom solution for you. There are plugins you can use to create an entire membership site or course on your website. It can break. One wrong click by an admin can make your website no longer be configured correctly and stop it from working. There are always backups to restore from, but you might not notice that something has gone wrong until students start to point it out. Depending on your website hosting service, outages can also happen. If you aren't checking your website multiple times per day, you might not notice when your website and courses have been offline for hours. Not only will that anger existing students, but it will also prevent you from getting sales from new would-be students as well. Requires updates. Normally if you use an LMS service, it comes with support and someone will keep all of your course platforms up to date for you. Hosting a website on an LMS will regularly require updates to themes and various plugins. Potentially more security risk. Having a course you host yourself could possibly be more vulnerable to hackers and spammers than one hosted by a large independent LMS provider. Using two-factor authentication, a strong password, captchas, lockouts after a certain number of password attempts, keeping plugins up to date, and other security measures can help to greatly lower the risk. Once you decide whether you're going with a LMS or CMS, let me know which you've picked in the comments section below and share what factors were most important in making your choice!